We do a lot of events and because of that, we wind up sending a lot of books out to make sure we have inventory. Over time, the extras make their way back to the press store from our partners, and as a result, we can accidentally wind up overstocked. When that happens, we need to recoup our storage space and make sure our books make it out into the world, and we’re doing that with an overstock sale. 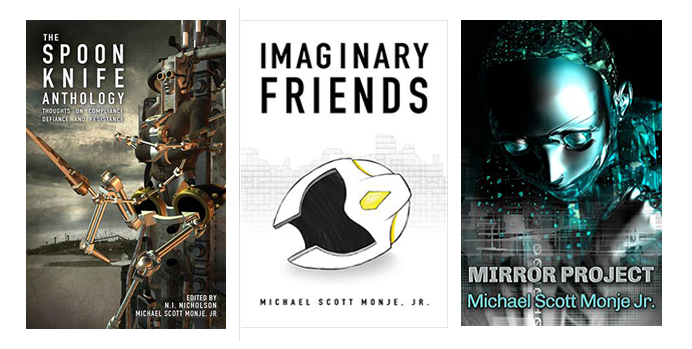 From now until St. Patrick’s Day (just because), we’re offering 40% off on two of our titles: Corbett OToole’s Fading Scars: My Queer Disability History and Michael Scott Monje, Jr.’s Defiant. Fading Scars, if you have not encountered it yet, is a gripping, close-up autoethnography covering several important events in the history of disability rights, civil rights in the U.S., and disabled communities. It takes a close look at the way they have been constructed, the way research in disability studies impacts communities, and the way communities work to impact research that affects their lives. It is an important read for anyone who seeks to understand how the current landscape of the disability rights and disability justice movements came to be. Defiant is part of my Shaping Clay series, alongside Nothing is Right and the soon-to-be released Imaginary Friends. In it, we join Clay Dillon shortly after he finally receives his autism diagnosis–at the age of thirty. As he seeks to navigate a professional life that finds his labor marginalized and devalued and a personal life thrown into turmoil by the collision between disability and a lack of access to basic medical services, Clay’s body begins to remember other divergences, and to force them into the foreground of his personal development. On top of its careful examination of the ways that adjunctification and workplace access impact disabled populations in the United States, the novel also takes an unflinching look at the violence that transgender individuals perpetuate against themselves when they attempt to deny their own nature. On top of our inventory reduction sale, we are also offering presales with instant ebook delivery for our U.S. customers. Like with our other titles, international customers are welcome to purchase the ebooks as long as they have a valid payment method, but we can not ship abroad. 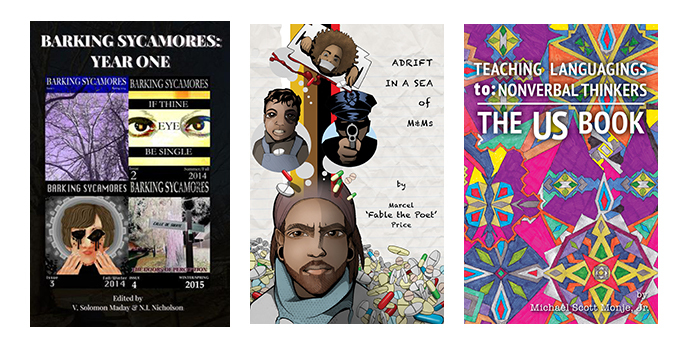 This March, our new releases include two anthologies edited by our new NeuroQueer Books coordinating editor N.I. 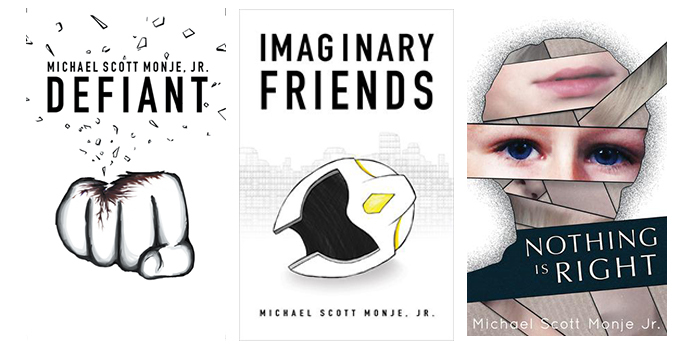 Nicholson, as well as my (Michael’s) newest novel, Imaginary Friends. 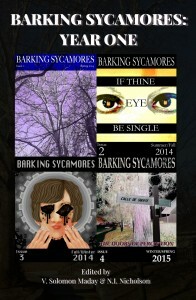 Barking Sycamores published its first issue in the spring of 2014 and from the beginning, it dedicated itself to providing a medium for neurodivergent voices in literature and art. In partnership with Autonomous Press’s NeuroQueer Books, the journal proudly presents its Year One anthology. Collected in this volume are its first four issues, first published online in 2014 and 2015. In a way, Clay himself is an “imaginary friend” to the adults in his life, insofar as when they look at him they don’t see him but instead see an imaginary child, a product of their own misconceptions and projections who has no resemblance (except in the external physical sense) to the real Clay Dillon. Every adult in his life is consistently one hundred percent wrong, all of the time, about Clay’s motivations, needs, feelings, thoughts, and perceptions… They can imagine neither the extent and nature of his difficulties, nor the complexity and sophistication of his thinking. Last but definitely not least, The Spoon Knife Anthology collects the work of over 25 authors, including Autonomous Press partners, disability studies scholars, established prose and poetry artists, and emerging storytellers from a variety of backgrounds. Together, these writers deliver a series of meditations on compliance and consent that are simultaneously intimate and alienating. We hope you enjoy them! And I’ll be back in a couple of weeks with some announcements about our June books! 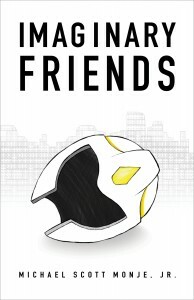 You can check out the pre-orders and the whole back catalogue at shop.autpress.com! Your time, effort, and attention are valuable. When you focus them to produce a piece of writing, that writing has value. When you give that writing away without being compensated for it, you are giving charity. It’s a gift. And like all gifts, you are notobligated to give it. Autonomous Press, founded in 2015, has published only one book containing the works of disabled writers who were not paid cash money for their contributions. The writers were, h0wever, compensated with at least one physical printed copy of the book apiece (to my knowledge, The Mighty does not print copies of contributors’ submissions for distribution). Contributors to the press’s second compilation, The Real Experts, were paid with contributor copies and cash; contributors to its third, The Spoon Knife Anthology, will be paid in similar form. Every single-author book Autonomous Press has produced to date is also paying royalties to its respective author. If AutPress can produce physical, printed books with a four-figure startup budget and compensate our contributors, The Mighty has no excuse for running a digital-only realm on a seven-figure startup budget and not paying its writers. And as for “exposure,” a print publication outranks a digital one on a CV every time. There’s a blog network coming. And we’re paying. On behalf of Michael and The Puzzlebox Collective, the Autonomous Press partnership would like to invite you to read the rest of the post with the benefit of a soundtrack. The embedded video is electronica (seizure sensitivity warning), but it is more in line with a World style than a heavy, warbly Dubstep beat. The visual is simply the band’s album cover art, a distorted logo, and their name, Laibach. The video should not autoplay. … [T]he spoon knife, that old woodworker’s companion that looks something like the tool it is used to make, only sharp and nasty and quick. A spoon knife is used to carve the bowl, which makes it curved, like a melon baller. It shaves away the unnecessary parts of the wood in layers, too, so it has to be sharp and strong, to keep slicing and slicing until it has peeled enough to make a depression in an otherwise smooth stick. It looks thin, like something made from an old beer can, but in a master’s hands, it rewards patience and precision. If we’re keeping with our extended metaphor, though, then we still have to ask the question: What is a spoon knife? We know what our symbol does, but what in our community is capable of doing that thing—cutting away layers of what shouldn’t be there, to leave us with the ability to do more, reach further, and nourish ourselves more successfully. What looks thin and weak, but nonetheless digs deep channels into reality? My belief is that the spoon knife is a story. For some, it’s an expression of solidarity that refills our emotional reserves even as it bolsters the morale of the one who offered support. For others, it might be an example that provides the cognitive scaffolding needed to get out of an abusive situation, or even just to recognize one in the first place. It’s also possible for it to be a confrontation, a reality that will not yield to our need until we learn to wield it and to control its damage with unwavering precision. NeuroQueer Books is proud to present the roster for the first volume of The Spoon Knife Anthology. You heard that right, folx. First volume. In a few months, you will see a call go up for next year’s edition, and it will be edited by Autonomous Press’s newest partner, Dani Alexis Ryskamp. She currently blogs at Autistic Academic and manages NeuroQueer. Before we can start taking submissions, though, Dani has to select her out-of-press editor because the book needs 2 people on it, and then they need to write a specific call that fits the second volume’s title. 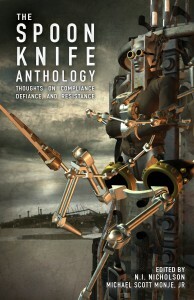 Next year’s edition will be called The Spoon Knife Anthology 2: Test Chamber. After that, we plan on rotating the editorship until every NQ Books editor has a chance to take on at least one volume. After that, who knows? It all depends on you, our readers and writers. 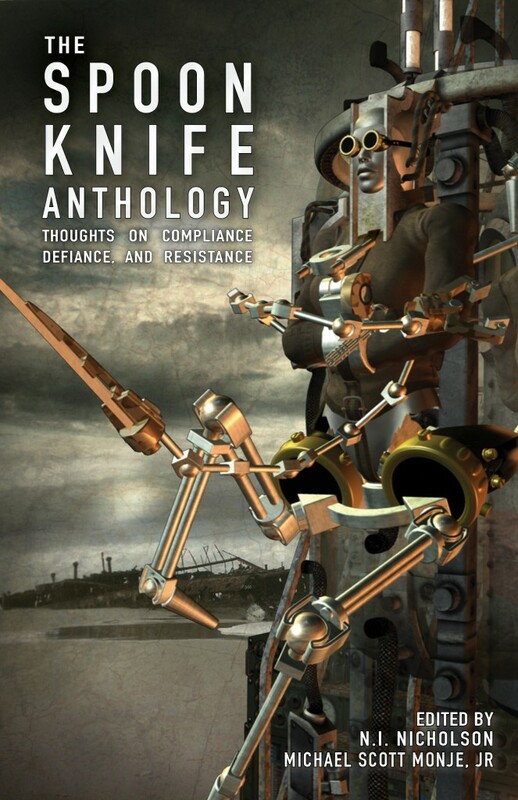 The Spoon Knife Anthology: Thoughts on Compliance, Defiance, and Resistance will be available March 15th from NeuroQueer Books. Stay tuned for preorder and early ebook sales on the AutPress Direct store.